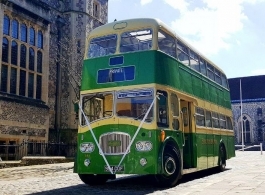 Classic 1960's Green & Cream double deck buses for wedding, proms and event hire throughout Sussex and parts of Hampshire. Double deck buses are a very popular & cost effective mode of transport which are unique and practical. There are a choice of two of the double deck closed top buses and one beautiful Open Top Green Bus. Please note the two 69 seater double decker buses are available April to October inclusive. The 69 seater open top bus is available April to mid October inclusive.